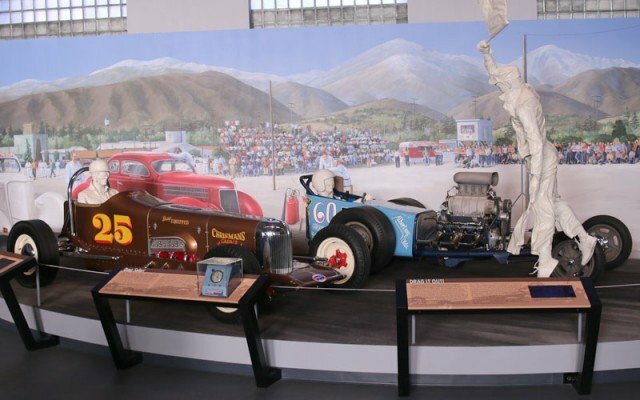 While we were reporting the 2015 Grand National Roadster Show the pre-show press conference was held at the Wally Parks NHRA Motorsports Museum. We had seen it once before, but we were so impressed with the new displays they’ve created here that we thought we’d show some of the museum displays to you here. If you have followed the history of street rodding you know that it was born in a racing heritage. Hot rodding in California was all about racing, seeing how fast you could go on the salt flats or dry lake beds. So the Wally Parks NHRA Motorsports Museum on the grounds of the Pomona Fairplex is a history book about early California hot rodding. One of the new displays at the Wally Parks NHRA Motorsports Museum is a tribute to Henry Ford and the quintessential 1932 Ford. It was the first V8 powered Ford produced on Henry Ford’s assembly line style manufacturing process which revolutionized the world of automobiles. 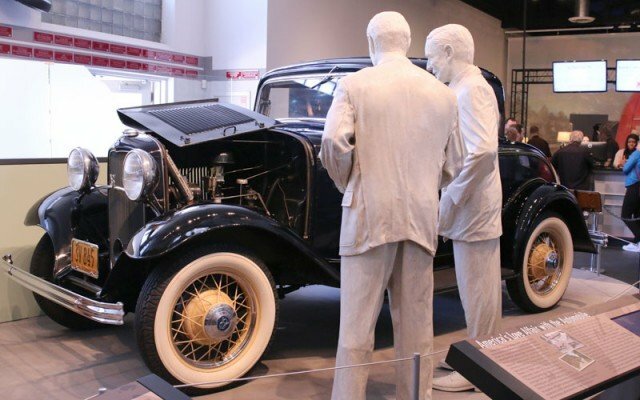 Here, Henry and Edsel Ford statues observe their 1932 Ford. Edsel was the president of Ford from 1918 on and influenced the Fords of the 1930’s. 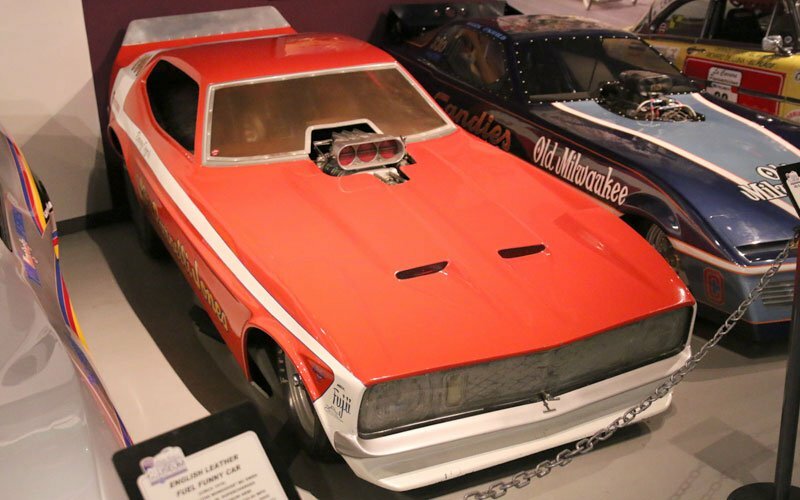 The Vel’s Parnelli Jones Mustang Fuel Funny Car was actually built on a Plymouth chassis. Danny Ongais drove the car for Parnelli Jones. It has a supercharged Keith Black 472 ci Hemi engine. Ran 225.90 mph completing the quarter-mile in 6.90 seconds in 1973. 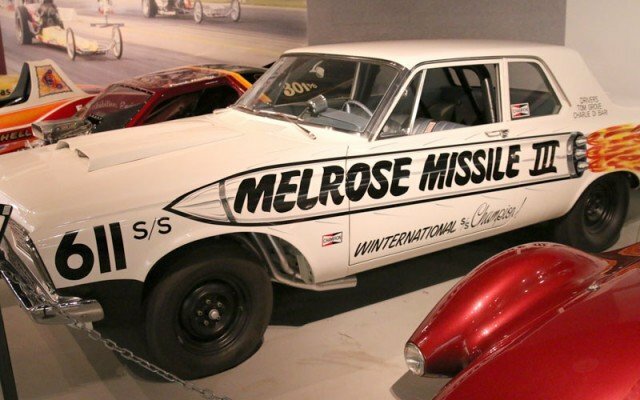 When factory manufacturers got interested in drag racing by 1963 cars like the Melrose Missile III excited the fans of Super Stock events. The 426 ci Max Wedge car was the 1963 Winternationals champion and set a record at Half Moon Bay with a 12-second quarter-mile at 118.26 mph. The car has been restored and is owned by Bob Mosher. We were surprised to see the Fred “Spade” Carillo 1927 Ford Bonneville Modified Roadster in the NHRA Museum. Cars On Line featured this car for sale in its May 2014 newsletter. 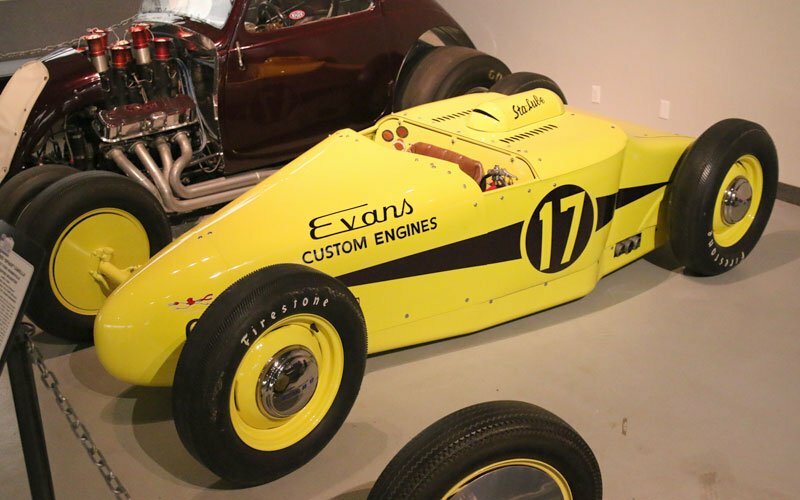 Click here to review our story on this early California salt bed racer. The J.E. 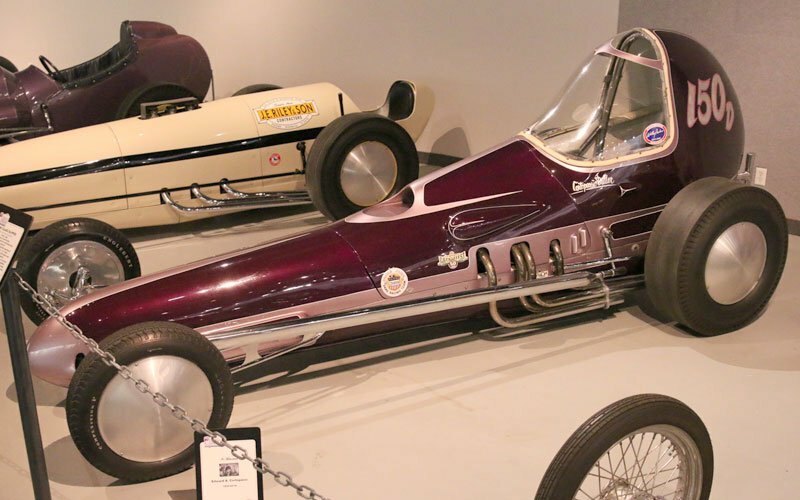 Riley Special Fuel Dragster was the first Top Elimintor winner at the inaugural NHRA Nationals in Great Bend, KS in 1955. In 1958 it was renamed the Hot Rod Magazine Special and broke records at March Air Force Base. The car you see here is a reproduction of the orignal using some of the parts off the original race car. It did a 10.30 ET at 143.95 mph on its 274 ci Mercury flathead. 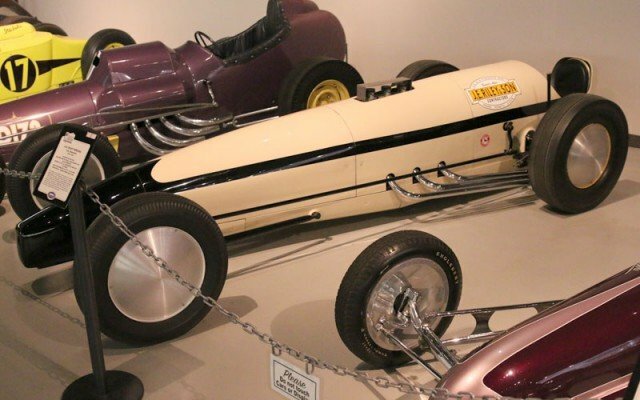 The Glass Slipper Fuel and Gas Dragster was the first enclosed canopy, fiberglass bodied dragster. It was the fastest Chevy powered dragster at the NHRA Nats in Kansas City in 1956. In 1957 it won the Oakland Roadster show in the America’s Most Beautiful Competition Car. It continued to be a consistent winner through 1962. 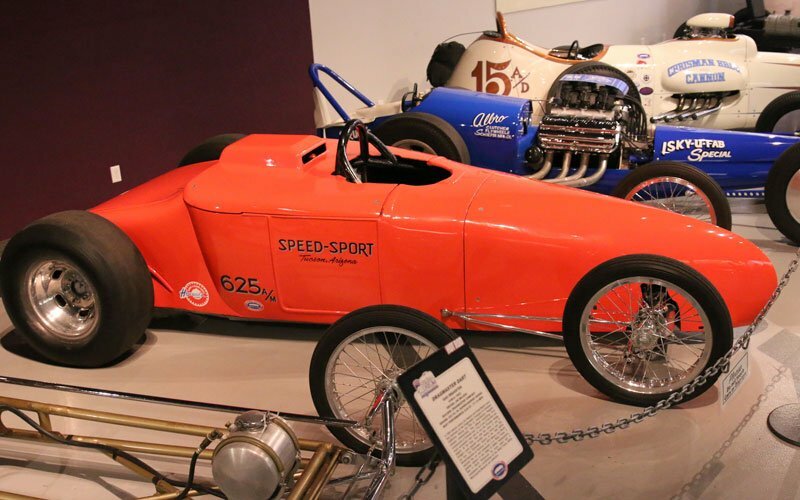 By mid-’57 the Speed Sport Special Modified Roadster was considered the “fastest car in drag racing” recording a 169.11 mph at Cordova, Illinois. For three years it was never beaten in its class. If you are in the Los Angeles area it is worth a trip to the Pomona Fairplex just to walk through the Wally Parks NHRA Motorsports Museum and see all the early cars that made drag racing history. We were here at the Fairplex to see the the competition for the America’s Most Beautiful Roadster award. If you have not yet read our report on the show and photo features here is a link to the 2015 Grand National Roadster Show.